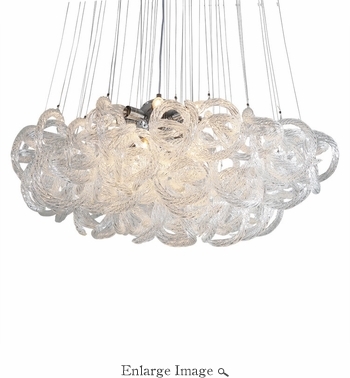 Thick, twisted coils of individually handmade glass loop around one another in a cluster on this stunning chandelier. The piece is suspended by adjustable aircraft cables in a design that's both industrial and enchanting. Due to the handmade nature of this piece, variations in color, tone, and pattern may occur. Bubbling is common in handblown glass and merely adds to the artisanal allure of the piece. Hardwired. Glass Dimensions H:14" x Dia:36"